Most of our balled and burlaped shrubs and perennials are grown right here on the farm. You’ll find all your favorite sun and shade loving perennials as well as many types of trees, fruit trees, ground covers, vines, shrubs, hedges, flowering trees, roses, ornamental grasses and gardening supplies for all your landscaping needs. Schartner Farms’ Nursery makes it easy to plant a beautiful garden in any area of your landscape. Whether you want to add color to a shady spot or you’d like a lovely three-season garden, we’ve got everything you’ll need. Looking for flowers that attract butterflies and hummingbirds to your property? No problem—we can help with that, too. The best “Good Neighbor” fences around. Let us help you plan your Green Fence. At Schartner Farms Nursery you’ll find all your favorite perennials, as well as some new and unusual varieties. Add a splash of color to your flowerbeds or perk up a backyard garden with some of the most gorgeous, top-quality plants around. Our selection of perennials ensures a lovely display year after year. With roses from Schartner Farms, you’ll have the most gorgeous display of elegant color around. From silky reds, sunny yellows, delicate pinks and luscious apricot blooms, our selection of mini, hedge and climbing roses are sure to enhance your beds, borders and trellises. We have a wide variety of sun-loving and shade-loving plants that quickly fill in bare areas and add interest to walkways and borders. Ground covers are perfect for slopes, erosion control and to fill spaces between lawn and garden. Colorful trailing vines are the perfect choice when you want to add beauty and interest to your garden. Clematis and trumpet vines are covered in beautiful flowers that are perfect for training up trellises, mailboxes and fences. Wisteria and honeysuckle look wonderful draped across arbors and pergolas. 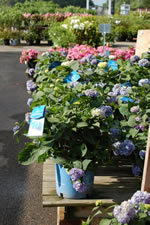 Whether flowering or evergreen, Schartner Farms has a large selection of shrubs and hedges. Lilacs and azaleas provide dramatic flare, while fast-growing privet and poplar help block out noisy neighbors and traffic sounds. Schartner Farms bright and colorful selection of ornamental grasses come in a variety of shapes and hues that look great in any garden or backyard landscape. Perfect for filling in bare areas, creating a manmade prairie or meadow, or adding color and texture alongside your house, garage or fence. Wonderful in containers, these grasses are perfect for patios and decks, too. In any landscape setting, trees provide beauty and shade for years to come. Whether you prefer a flowering tree or trees with interesting foliage, Schartner Farms has a variety for you.